The Summary page gives an overview of the remote system, including information like IP Address, Customer Name, Computer Name, and Platform. Depending on your account permissions, you may have the option to log out the Windows user automatically or lock the remote computer when the session closes. When you have been working on an unattended system, for example, locking the computer is recommended to prevent unauthorized users from viewing private information. Tap After This Session Is Finished, and then select the action to take at the end of the session. You can also add notes about the session. If the session is shared or transferred, these notes can be submitted by one representative and pulled by another for a quick, private review of the situation. These notes are also available in the session report. 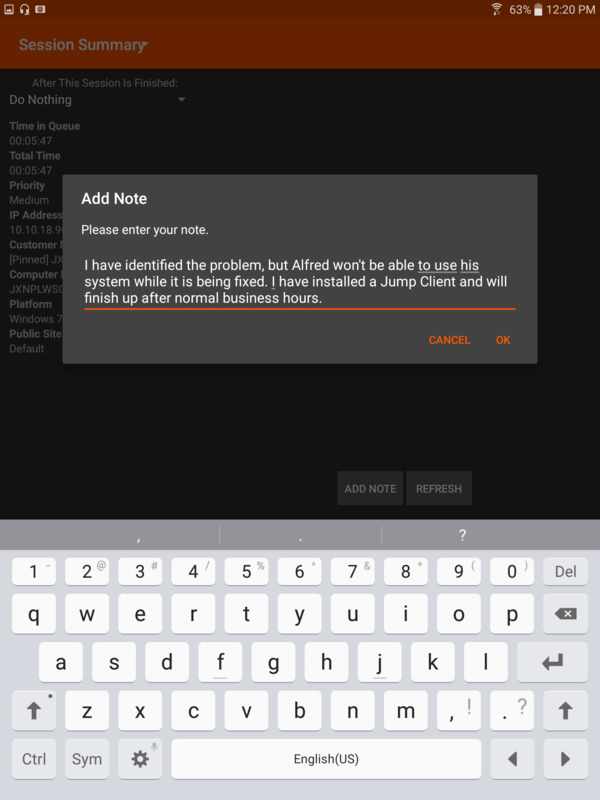 Notes can be added both during the session and also after the remote connection has been terminated.